Bologna doesn’t have the magnificent ruins of Rome, the picturesque canals of Venice, or the tremendous artistic wealth of Florence. I don’t consider myself a foodie, but I do love food. 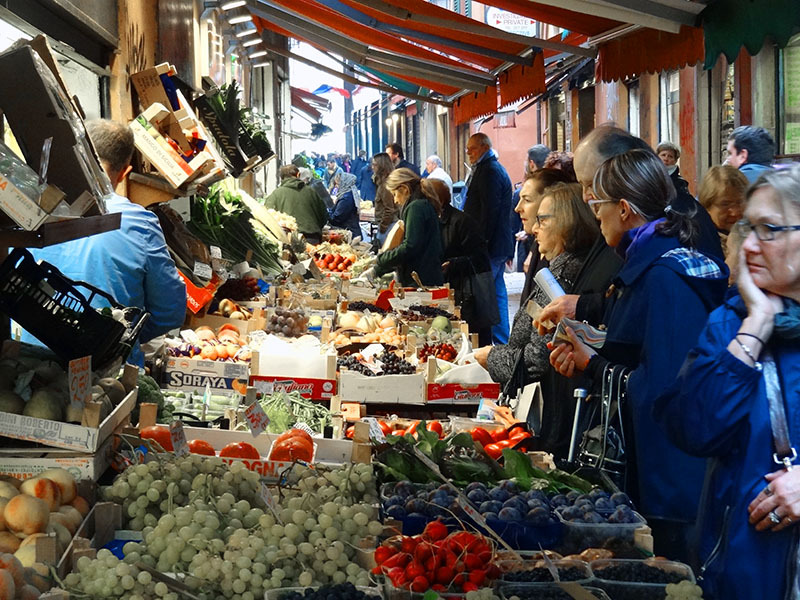 So while in Italy I decided to set off to learn about Bologna food, and see the ancient markets of the city. And, of course, have a bite or two along the way. Desiring to be educated by one close to the source, I contacted Marcello Tori of Bluone Food & Wine Tours in Italy. The company is located in Bologna, and I had gone on a truffle hunt with them a day earlier. I started my quest on a rainy morning at the entrance to the basilica on the Piazza Maggiore, the meeting point for my tour with Raffaella, Marcello’s wife. Raffaella wasted no time whisking me, along with a couple from Pittsburgh, into the old Quadrilatero market area adjacent to the Piazza. Our first stop in the market was at the 100+-year old food shop Paolo Atti & Figli on Via Caprarie, where Raffaella began her cultivation of our knowledge of pasta. She showed us pre-baked lasagna, using it as a prop to explain the importance of it in Bolognese cuisine, describing how it’s made with different layers including béchamel sauce. Inside the old shop, there were walls and shelves filled with pasta, with two clerks waiting on local patrons. Standing there I felt I had been transported back a century earlier. After a while we were out the door and walking through the streets of the Quadrilatero once again, continuing along Via Caprarie to A. F. Tamburini. Founded in 1932, it also is one of the city’s most famous food stores. At first, I thought it was mainly a butcher and cheese shop, and then saw they had quite a bit of pasta as well. As Raffaella discussed things with the couple from Pittsburgh, I roamed about and quickly realized the place was a lot larger than I first thought. In the rear, there was an oven in which meats were being roasted, and an area that seemed to be a small cafeteria with many tables for patrons to sit and eat. As we exited the store, we ran into an Australian couple that had been on the truffle hunt with me the day before. As we chatted, they told me this was the place where they had an incredible lunch and had raved so much about to me. I remembered their reviews well, and instantly decided I’d return for lunch after the tour. We made a quick stop for a welcomed late-morning coffee at Eataly before continuing up Via Drapperie. Part way along we stopped briefly in a little shop selling wines and aperitivos before continuing on to two fish shops, both doing a very brisk late-morning business. It was amazing to see the mix of people in the fish stalls in the medieval alleyway, with dress ranging from very casual to business suits. 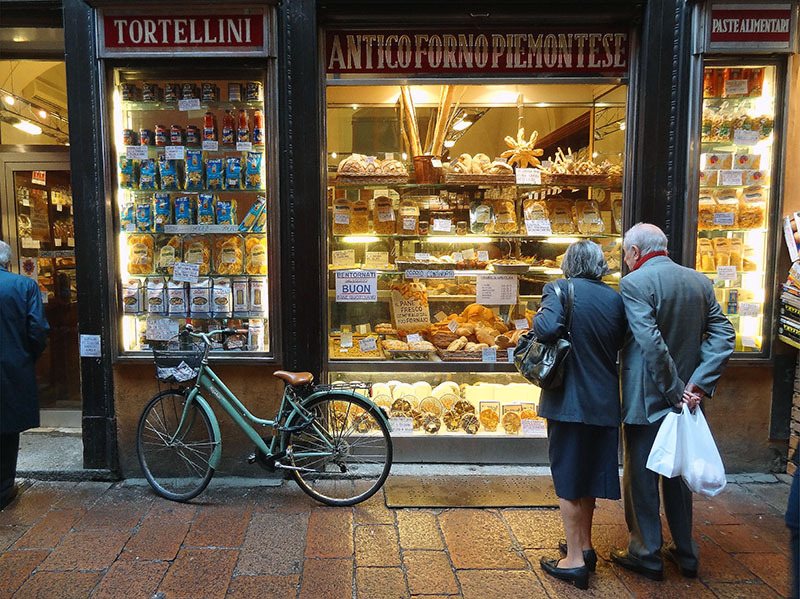 We wandered down several more streets, pausing at various vegetable stalls and finally visiting Vecchia Malga (Via Pescherie Vecchie, 3/A) a well-known store offering regional specialties. As we continued meandering through the market, Raffaella explained that there are other market areas spread out about the city that are cheaper, but the Quadrilatero is the only place where everything of high quality is brought together in one spot. The number and variety of foodstuffs all around were nearly overwhelming. At the end of the tour, Raffaella wanted me to return with her and the other couple to her home to cook the things she had bought on our market foray. I had to decline, however, since I had to meet someone in a bit over an hour. After bidding everyone ciao, I headed back to Tamburini for a quick lunch. When I arrived the little cafeteria in the rear was in high gear. There was a line of people, mostly Bolognese, giving their orders to the counter-person who was dishing out large-sized portions. 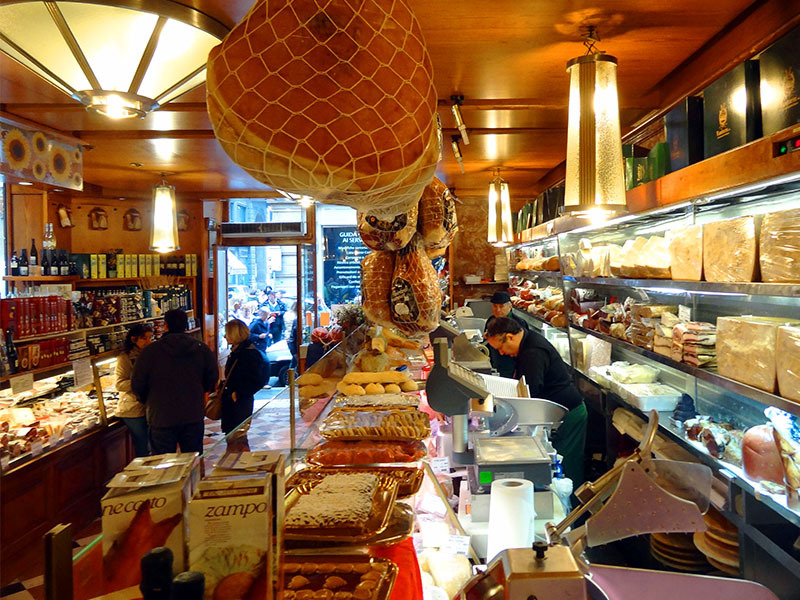 I quickly realized that for lunch the Tamburini was one of the best places to go in Bologna. There were many things to choose from including various kinds of pasta, salads and some meat dishes. If requested they would also bring individual plates of meats (prosciutto and others) to your table straight from the butcher shop. I opted for a large serving of Tortellini. Along with a half bottle of good Chianti Classico came to about $18. It was a great experience, and while eating, I realized that my tour with Raffaella, had enhanced my dining experience. The food was delicious, and the place had all the charm of old Italy. It was just what I’d come to Bologna to experience. Interestingly, although one would expect Tamburini to attract a lot of students and tourists, its patrons were mostly adult Bolognese. After lunch, I was off to the tourist office to meet Giorgia Zabbini whom I had met several years earlier at a trade show. 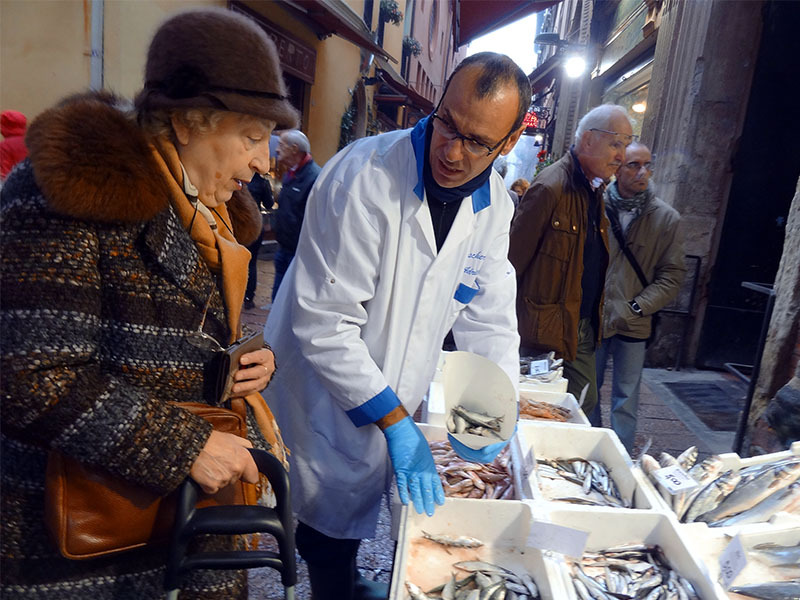 When I had told her I would be making a short visit to Bologna for a market tour she also offered to show me the some of her choices. They would be the best special places in Bologna, that I likely wouldn’t see otherwise. Who could refuse such an offer? The inside, with its wooden tables and faded photos on the walls, looked more like an old social club. 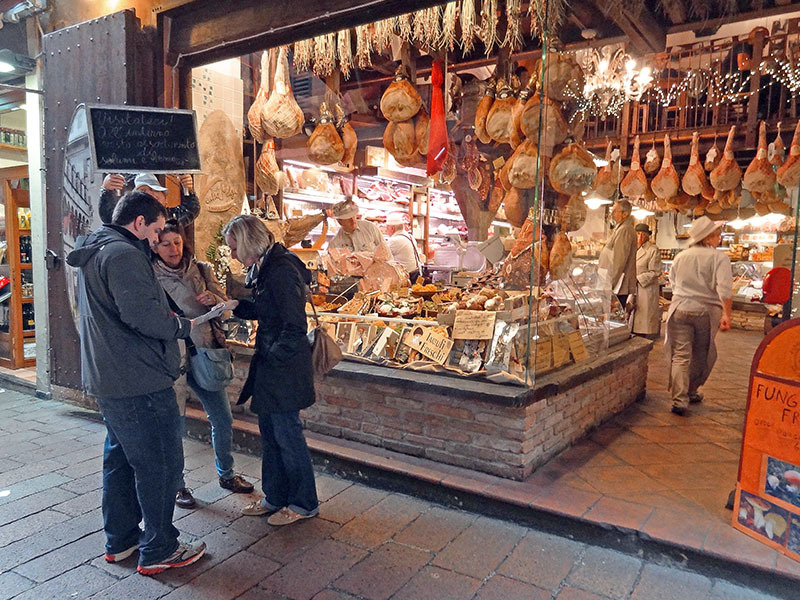 You won’t find any of Bologna’s wonderful foods here, so bring your own. But its little bar (“they only serve wine, not water or Coca-Cola”) offers about 20 different wines either by the glass or by the bottle. At one table a smart couple had an impromptu picnic with food bought in the marketplace. All around them groups of men sat drinking and talking. Many people consider it the best bar in Bologna. We were then off to Caffè Zanarina (Piazza Galvani, 1), the premier chocolate gourmet store, and bar in Bologna. I’ve been in many chocolate shops but had never seen anything quite like this. Inside was an array of chocolate creations ranging from a replica of one of Bologna’s famous towers to chocolate iPhones. Off to the side was an aperitivo bar, something “almost sacred to the Bolognese,” Giorgia confided. Our final stop was at the Chamber of Commerce building, where a safe holds a piece of Tagliatelle in gold. It shows the exact size the pasta must be to be authentic. We weren’t allowed inside but Giorgia provided me with the official Chamber booklet of Bolognese recipes. While we returned to her office she shared with me two other important pieces of information about Bologna. And the other important thing I should remember? Although you’ll find Bologna food always good, Bologna’s weather is a bit iffier. Temperatures range from a low of 30°F in January to a high in the mid-60 °s in the summer. It rains on average 1-2” per month throughout the year, with the wettest months being April-May and October-November. On the other hand, whatever Bologna’s weather may bring, you’ll often be indoors with a plate of fantastic Bologna food. The local vegetable market is so tempting. A holiday is incomplete without eating the local flavors. 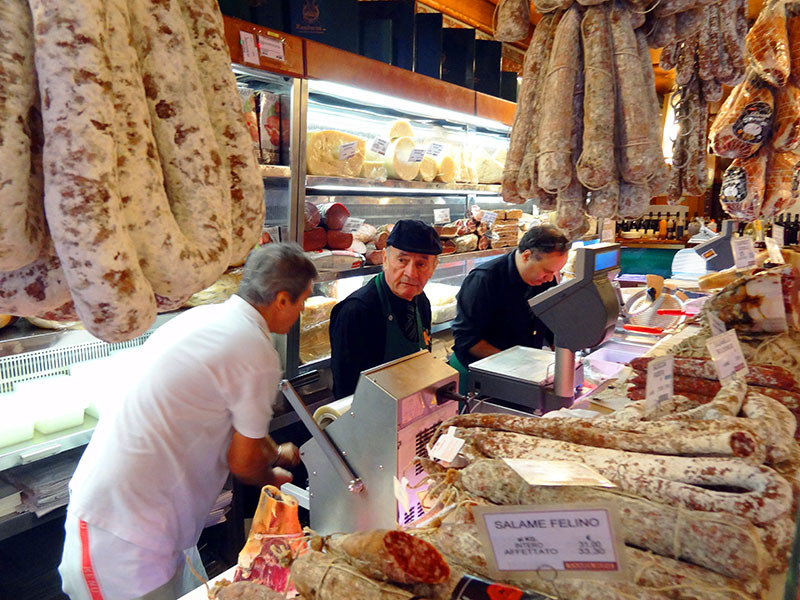 Your food guide to Bologna is an excellent guide when visiting the city. While I think I’d enjoy EVERYTHING about this trip, the Caffè Zanarina really jumps out at me. Delish!!! Recently, I was in Italy for a research paper presentation in a conference in Palermo, Sicily. I loved the beauty of the place and the historical anecdotes related to each monument. Your post takes me on the Foodie path of Italy where my foodie friends can stay on and taste various varieties for a lifetime! Thank you for the post. It is highly shareable! I love Bologna and its rich culinary tradition. This is such a useful guide and I will use it to buy food-souvenir next time in town. I am so glad I stumbled on this post! I have been thinking of visiting Bologna for quite sometime and this is a beautiful demonstration of why people should visit! Thank you for sharing these tips! Ooh, a food trip! Look at all those sausages and cheeses! Those are quite expensive in the Philippines. Thank you from Atti Bakery! You’re very welcome Paolo. You have a good bakery! If only Bologna was in the 60’s in the summer. Average temps are high 80’s with some days hitting 100 and with its humidity it always feel hotter. I read this post while eating spaghetti with a pesto mix I bought in Genoa during my trip in November last year… Italy’s food scene is so amazing! Bologna looks like a great place, now I’m hungry for more! 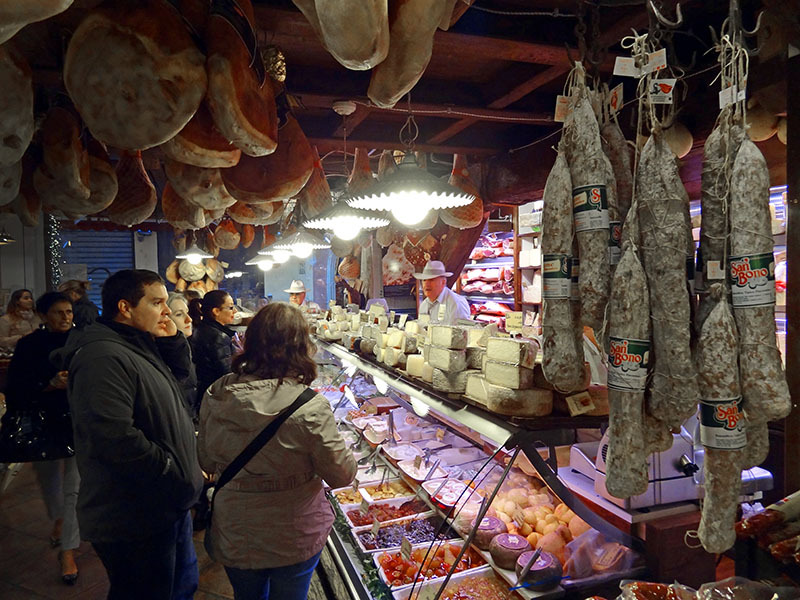 Bring your appetite when you travel to Bologna! 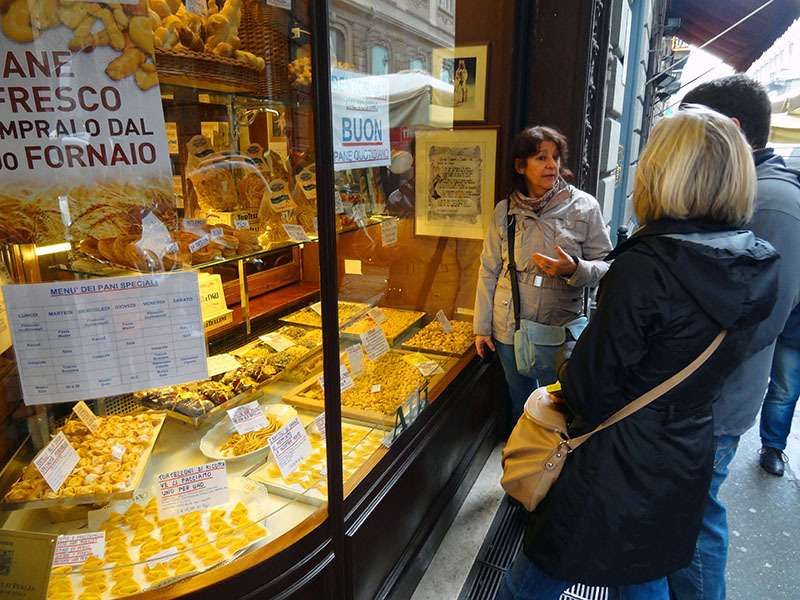 I think food tours are one of the best ways to learn about the cuisine of a destination. Tamburini sounds like a place I would like to eat since most of the patrons are locals.